I am encouraged to see the way in which organizations that care about the media are throwing themselves at trying to find new, sustainable ways of creating and disseminating journalism. What's going on at The USC Annenberg/Getty Arts Journalism Program with the creation of Engine29, its “pop-up” arts journalism lab, reminds me of the kind of energy that's happening here at Stanford with the Knight Journalism Fellowship, where 20 journalists from around the globe, myself among them, are working on an array of projects aimed at innovating the field of journalism. Engine29 is focused on the arts and lasts just over a week. The Knight Fellowship is much broader in its scope (the participants come from fields as diverse as the environment, documentary film, design, investigative reporting and the arts) and goes on for almost a year. But in our endeavors to innovate, I wouldn't be surprised if we all end up using the same basic tool: Brainstorming. I got a fresh take on this much-used buzzword a couple of days ago, when Tina Seelig, an author of many books about entrepreneurship and the Executive Director of the Stanford Technology Ventures Program, led a seminar for my group about brainstorming techniques. I had always thought of brainstorming as being somewhat useful, but Seelig made me see how revolutionary a tool it can be when you're trying to figure out innovative solutions to problems. - There are no bad ideas. - Wild ideas are encouraged. - Kick things off with a short warm-up exercise e.g. come up with as many words as you can using the letters in the word "entrepreneurship." - The problem to be solved in the brainstorming session needs to be framed in such a way as to inspire people. "How do we solve world poverty?" is too big and deep a problem. "What color should the bowls that we buy to feed starving people be?" is too small and superficial. - Keep reframing the question every few minutes so that the group can sustain its brainstorming activity over a long period e.g. "How should we spend $10 million?" --> "How would a 10 year old spend $10 million?" --> "How would someone spend $10 million in the desert?" --> etc. - There should only be one conversation going on at any one time. - A brainstorming group should consist of about six to eight people. - Everyone in the group is in possession of a pen and a set of post-it notes. - Everyone in the group stands throughout the brainstorming session, writes ideas on the post-its and sticks them to the wall. - People need to be open-minded and build on each others' ideas rather than criticize them at this stage. The best response to an idea is "Yes. And...?" not "Yes. But...?" 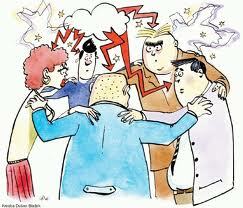 - Refrain from organizing ideas and making decisions about them during the brainstorming process. But give brainstormers the chance to process them a little at the end of the session by allowing people to mark the best or wildest or most likely to succeed ideas with different colored dots. - A brainstorming session has succeeded if people think that the ideas are the result of the entire group's work, rather than generated by an individual. Our session with Seelig culminated with us getting into groups of four or five and brainstorming ideas for "the worst restaurant idea in the world" for five minutes. Then we swapped ideas with other groups and spent seven minutes turning those very same bad ideas on their heads to frame them as "the best restaurant idea in the world" and create a pitch to present to the rest of the class. This exercise was silly, yet game-changing. In a very short amount of time, we saw how brainstorming can transform ideas. What seemed like preposterous notions for dining out -- examples from our session included everything from a restaurant run by toddlers to a virtual restaurant with no website to a restaurant which only serves salt and is run by a hairy, naked chef -- suddenly became madly appealing when reframed by a set of creative, open minds. "SAL" the name of the restaurant with the salt and scummy chef actually sounded vogueish by the time the brainstormers who were given that idea had re-tooled it as a place serving rare salts by a famous minimalist, performance-art-oriented chef to models and celebrities. I'll be interested to see what ideas the arts journalism aficionados in Engine29 comes up with from their brainstorming sessions -- assuming the group has brainstorming sessions. It really should. Hello, my congratulations for showing a perfect games in wwba 15u national championship, https://www.linkedin.com/pulse/amazing-people-company-how-find-those-perfect-laura-callisen i think you can win it in next season! Good job guys keep it up!